“Leading in the One-to-One context comes down to assessing the abilities and focusing the energy of individual direct reports so they can attain and sustain independent achievement in their work-related roles,” says Zigarmi. The One-to-One context of leadership places emphasis on your leadership mindset and your efforts and actions that are focused on teaching, encouraging, guiding and supporting that person. Having focused, One-to-One conversations with individuals to discuss their goals, where feedback and recognition is open and transparent toward their end goals, is critical to developing trust, optimizing motivation, and keeping individuals moving in a positive direction toward their objectives. Do you lead the same way, all the time? Read more insight from Dr. Drea Zigarmi and his colleagues on this type of contextual #leadership today from @InspireSoftware!Tweet This! Because leading in the One-to-One context is so critical to an individual growth and success, it’s important to consider how to create create a motivating culture for my employees so they are encouraged to develop to their fullest potential and stay satisfied with their work over time. I once took a salsa dance class with my wife, a seasoned dancer herself, and it was one of the most challenging experiences of my life. Salsa is reliant one person leading the dance and the other one following in the flow of the music. Without the proper training and skills, I was helpless in leading the dance with my wife. It took time, effort, and patience to get to a point where she was able to follow my lead on the dance floor. I still have a lot to learn! 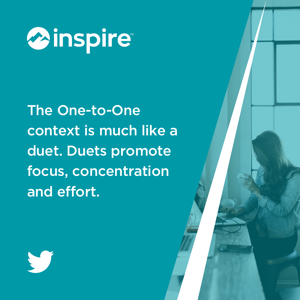 The One-to-One context is much like a couple’s dance and takes focus, concentration and consistent effort. It requires an ebb and flow of energy, and consistent timing. Through regular One-to-One meetings between a leader and his or her direct reports, is where the heart of leadership takes place. Taking time to assess their needs and provide a leadership style or skill that fits the needs of that moment is critical to an individual’s success and overall development. The ultimate purpose of leading in the One-to-One context is to develop the ability and energy of the individual to achieve their own goals, while aligning those goals with the needs of the organization. Research tells us that when an individual sets out to pursue a goal, they go through a series of phases on their journey to achieve that goal. The biggest challenge for leaders is to consistently stay in tune with the needs and attitudes of the people they are attempt to lead toward that goal and common objective. It’s the leader’s responsibility to regular, at least once every other week, to determine and discuss the individual’s abilities and energy to achieve the goal. Depending on what stage the individual is in, will require the leader to adapt and respond to their direct reports needs in the moment. The challenge for today’s leaders, in the One-to-One context, is not only to find the time to meet individually with their people on a regular basis, but also to prepare for meaningful and effective conversations about their goals with them. This is one of the most overlooked and unperformed aspects of leading in the One-to-One context--having that prepared focused One-to-One time to discuss key insights and challenges of helping individuals reach their goals and meet the needs of the organization and the clients they serve. Many managers claim to have one on one time with the people reporting directly to them. However, with today’s flatter organizational structures, manager’s need to perform multiple roles at one time. Conversations can be rushed and unfocused, if any conversation takes place at all. This rush leaves little room to develop the individual by exercising key leadership skills, practices or competencies to help their people grow and achieve their goals with efficiency. Dr. Zigarmi and the co-authors of Achieve Leadership Genius has researched and evaluated 5 key skills to improve One-to-One performance conversations. Good performance starts with effective goal setting. It’s a leader’s responsibility to initiate that process and help individuals set goals that are aligned to their roles, their skills, and ultimately aligned with the team, department, or organization’s overall strategy. Helping individuals learn to how to set effective goals that are specific and measure key results, help them set a positive motivational outlook toward their performance toward those goals. Most managers and teams have goals, and individuals are asked to contribute to them, but it’s foundationally important to help individuals set their own clear objectives and discuss how they are aligned. The second critical skill of leading in a One-to-One context is the ability to deliver quality feedback. The goal of feedback is to inspire your workers, not to discourage them. Many leaders give their opinions, suggest ways their team members could do a better job, or offer course corrections to the people they lead, but too often feedback is given to individuals effectively. Leaders need to focus their feedback on goals, rather than just giving them feedback on comments they made during a meeting or a way they come across to others. Effective feedback on performance is delivered in a safe, One-to-One environment, and based on a combination of pure observations about the pursuit of the goals, and personalized details on how they might address any challenges, questions, or concerns they have about making progress on the goal. Listening is a skill! Some may consider it to be the most underrated skill a leader needs. Most leaders don’t realize that there are actual fundamentals they can exercise to become a better leader in the One-to-One context. Many leaders think they listen to their people simply by allowing them to express their thoughts and opinions on their personal goals or projects the team is working on, but there is more to listening than just hearing what your people have to say. Great leaders take the time to listen to challenges their people are having on a goal, by paraphrasing key points they heard in a discussion or through a threaded conversation online. Leaders become better listeners by summarizing what they heard the individual say during a meeting and ask if they have a clear understanding of what the individual is discussing. Listening in the One-to-One context is a critical leadership skill that can help individuals identify and solve critical business issues related to the goals they are pursuing. Every pursuit of a goal is fraught with challenges, setbacks and concerns. It’s important for leaders to help individuals effectively identify and solve problems on their own. The tendency for many leaders is to control the circumstances of the business challenges, by either identifying what they think the problem is or offering solutions to a problem prematurely, before engaging the people they are seeking to help achieve their goals. One of the most core adult learning competencies needed for today’s workforce is centered around problem-solving. Adult learning must be viewed as an interactive activity based on questions, instead of lessons. Leaders must guide the transfer and application of concepts of real-life work problems that need solutions. Additionally, iit needs to be effectively influenced, not controlled by the manager. Empowering individuals to generate potential solutions, with pros and cons to each solution, increases the motivation and engagement of the individuals pursuing their goals. The days of simply becoming a cheerleader for your team to achieve success us over. Managers need to do more than just praising people’s progress. Today’s leader needs to be more sophisticated on how they optimize the motivation of their people in a One-to-One context. Leaders need to recognize positive progress and express gratitude for people’s contributions, but they also need to offer feedback that helps build their energy and ability as they pursue their objectives. It’s important to have ongoing conversations about competence toward achieving a goal, whether they feel connected to others on the team during the pursuit of the goal and whether they are in control of how the goal is being pursued. If an individual’s internal motivations are not being consistently discussed, leaders may be missing a major opportunity to help individuals grow and remained engaged in their work. Leadership is both an art and a science. Are you equipped to lead the dance between you and the individual’s you lead? Discover how these activities can help you hone your leadership skills from @InspireSoftware!Tweet this! to help leaders develop and guide their people toward common objectives. Helping individuals define and achieve meaningful goals is at the heart of professional performance. Leaders play a significant role in developing the most important resource within organizations--their people. Influencing your people, in a One-to-One context increases individual performance, leads to higher engagement in their work, retains the best talent, and ultimately fuels the achievement of important business objectives for the organization. above. In order to lead in the One-to-One context, you must be able to connect each of the competencies together. Without defined goals, how will you deliver effective feedback? How will you aid in problem-solving if you do not understand the dilemma your student is experiencing? How will you motivate your lead if they are discouraged? The key to individual development within the One-to-One context is by understanding how to implement these competencies and ultimately transforming them into life-long learners. About the Author: Jason Diamond Arnold is the Director of Leadership Solutions at Inspire Software where he brings his 20 years of experience in leadership development to the design of leadership services and learning content through the performance application. Curious about the other contexts of leadership? Discover the other four facets of contextual leadership in Dr. Drea Zigarmi’s book, Achieve Leadership Genius, today!